Successful Sheffield rock and metal band formed in 1977, around the time of the New Wave Of British Heavy Metal. Members include Joe Elliot - lead vocals and keyboards, Rick Savage - bass, keyborads and vocals, Rick Allen - drums, Phil Collen - guitars and vocals and Vivian Campbell - guitars and vocals. 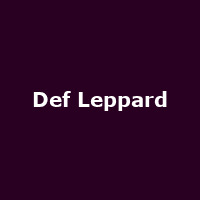 Their key songs are many, but include "Wasted", "Rock Of Ages", "Animal", "Hysteria", "Rocket", "Dogs Of War", "Pour Some Sugar On Me", "Let's Get Rocked", "Heaven Is" and "When Love & Hate Collide". The album "Hysteria" was their commercial peak in 1987, while others include "Adrenalize" and "Songs from the Sparkle Lounge".